Learn the proper catching mechanics secrets from one of the top softball coaches in the country. Sue Enquist of UCLA is joined by one of her top former catchers and now an assistant coach, Kelly Inouye-Perez. Catching Mechanics presents a detailed overview of the fundamentals and techniques involved in sound catcher play. In an easy-to-understand and apply manner, the DVD explains and shows how each of the key responsibilities of a catcher should be handled. Among the topics covered in the DVD: signals, throwing to third, catcher’s stance, left-handed batters, receiving and framing, catching pop flies, blocking the plate, intentional walks, throwing technique, plays at the plate, weight transfer, catcher’s responsibilities, and pick-offs. Also includes coaching tips. Sue Enquist is the head softball coach at UCLA. A 1980 graduate of UCLA, Enquist has had a long and storied career with her alma mater. As a centerfielder for the Bruins (1975-1978), Enquist had a then record career batting average of .401, while earning honors as UCLA's first softball All-American. From 1980-1988, she served as an assistant softball coach under longtime Bruin mentor, Sharron Backus. She then serd as the Bruins co-head coach with Backus from 1989-1996. In 1997, Enquist assumed the role of sole head coach for the Bruins. During her extraordinary tenure on the bruins coaching staff, UCLA has played in a record 18 championship games winning 10 titles -- including the 2003 and 2004 championships. (In 2005 and in 2002 they were runners-up). Kelly Inouye-Perez was the starting catcher for three Bruin NCAA Championship teams in 1989, '90 and '92 which included perfect fielding percentages her junior and senior seasons. She played on US International Teams in Japan (85') and in Peru (87') as well as catching several elite pitchers, including Lisa Fernandez, Lisa Longaker and Dee Dee Weiman. 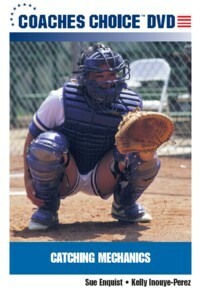 This DVD is available now to help all of your catchers. Here's an even better Deal! Get a great set of catching knowledge and save $20 in the process! Here are 2 other DVD's. Get all three for only $100. That's $20 off, if you bought each one separately. This will really step your game up to the next level.